The key to any successful apparel manufacturing company is giving customers what they want. When you make errors on an order, you risk losing your customer’s trust and, inevitably, their business. It’s important to ensure order entry for apparel decoration is done correctly to cut back on errors. Many manufacturers worry about how to handle the delicate balance of speed versus accuracy — where a lack of either could result in further customer complaints. However, it’s possible to accomplish both simultaneously. When you approach the problem intelligently, you’ll find it doesn’t take that much extra attention to detail to eliminate errors on decorated apparel entries. We’ve compiled a few ideas to get you started. Bringing customers into the equation offers new levels of transparency to the process. It also ensures the customer can bring problems to your attention early on. For example, you may require the customer to sign off on a proof for an order before you process it. This ensures there are no surprises on either side, and the customer will appreciate the opportunity to oversee the progress on their order. Plus, in doing this, you’re protecting yourself. If you have any questions, you can easily check on them before you go ahead with the order. Your customers will appreciate that diligence. Entering a decorated apparel request incorrectly, such as incorrect style, color, size etc. When you integrate your e-commerce and ERP applications, you put key information in the hands of your customers in real-time. This will increase your company’s efficiency by having your customer have a more active role in managing their account thus reducing the amount of time your team will spend on updating your customers with order information. 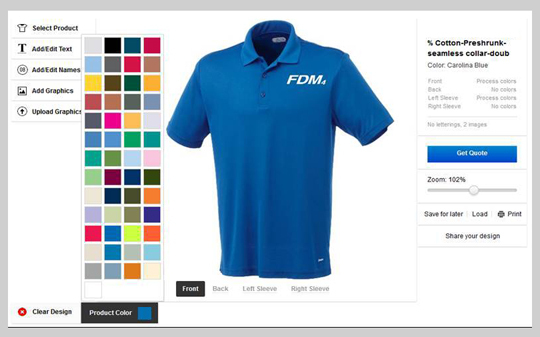 Eliminate time-consuming and costly order errors at your apparel manufacturer by investing in software from FDM4. Our products can help you become more efficient and more accurate, leading to happier customers and more repeat business. Contact us today.